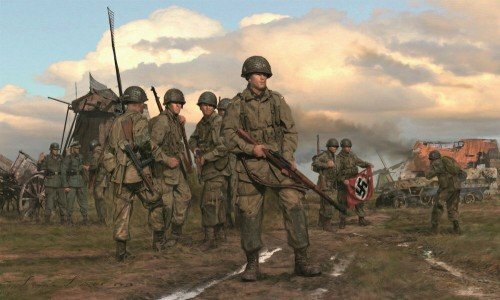 By the time they were called upon to jump into Holland during Operation Market Garden, the men of the US 101st Airborne Division had become one of the toughest and most formidable units of the entire US Army. In Simon's commanding piece the men of Easy Company, 2nd Battalion, 506th PIR take a brief moment to reflect on their recent action during which they overpowered two entire companies of battle-hardened German Waffen-SS troops entrenched, with artillery support, along a Dutch dike, 5th October 1944. To add authenticity to this poignant release, the edition is personally signed by veterans who fought in Holland with the 101st Airborne, giving collectors the opportunity to acquire a historic and exclusive edition. Using the most sophisticated digital Giclée technology, each Studio Proof is printed directly on to fine canvas creating a stunning piece which has all the look and feel of an original painting. Each canvas proof is supplied pre-stretched ready to simply drop into a frame of your choice.